A French classic with a touch of Italy. Your family will love this simple, flavorful shrimp and vegetable pasta! In a medium pot, over medium-high heat, boil linguine until tender, approximately 10 minutes. Drain. Meanwhile, in a medium pan, over medium-high heat, heat the olive oil. Add garlic, sauté 2-3 minutes. Add shrimp, sauté until pink, approximately 4-5 minutes. Season with salt and pepper. Add red onion, tomatoes, olives, green beans and red pepper flakes. Sauté additional 2-3 minutes. In a small bowl, whisk together mustard and vinegar; add to pan. Add wine, reduce heat, simmer 4 minutes. 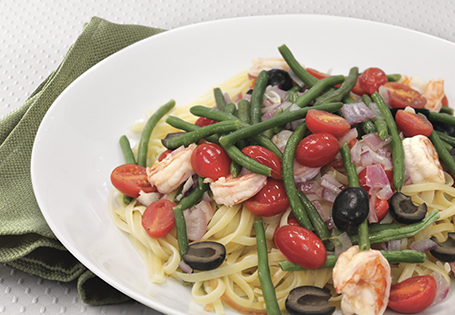 Transfer linguine to a large bowl or platter; top with sautéed shrimp and vegetable mixture. Garnish with chopped parsley, if desired.